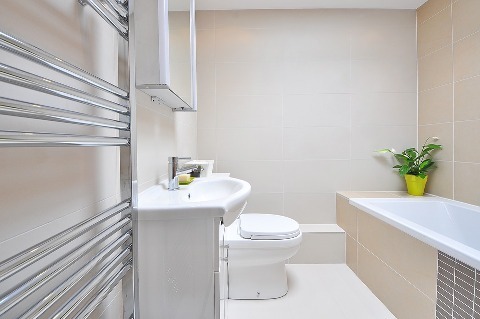 Bathrooms can be the best option for improvement of your lifestyle and home value. Installing a new basement bathroom means new bathroom plumbing installation. The cost of running new bathroom lines can dominate your budget, so set priorities and decide where to splurge and where to save. Costs for a basement bathroom are the same as for an upper level one, however, the concrete foundation, running water lines and providing drainage make it different. Before installing basement bathroom make a cost estimation of the project to set a budget. It can be a maze like task, if you are not familiar with construction estimating. The only option is to ask a contractor to quote the price. Installing basement bathroom involves many factors, including framing, plumbing, drywall, wiring, flooring, shower installation and finishing. Professional plumbers will charge $45-$65 per hour. A full plumbing job (approximately 46 hours) - planning, site preparation, fitment and installation of a shower, toilet, bathtub and sink; plumbing supply line - will cost $2070 - $2990. The cost of adhesives, fittings, sealersand finishes can be around $100. The price of the fixtures will depend on the chosen style and quality. Expect to pay $400-$1500 for a low cost bathtub, a sink will cost around $100-$500, to install shower will cost $450-$2000, a new toilet can be around $100 and $250. Removal and disposal of old plumbing fixtures (toilet, sink, bathtub and shower) will be $150 in addition to $450-$650 paid for 10 hours of labour. Changes in your floorplan will cost $500-$1000. A thick concrete slab as a floor, running drainpipes and water lines can be very costly. If you choose the conventional route, you will have to dig into the concrete and tap into the main drain line and run water to the fixtures. Actual costs will depend on conditions, job size and size options. So, average cost of such basement renovations in Toronto depends on many factors, it will generally cost less if you have a concrete slab foundation that has to be cut through. A basic bathroom addition can cost from $10,000.00 to $25,000.00.